Widths Over 1/8" to 7/16"
Made of a solid part of titanium that is cut from a mission flown part of the SR-71 Blackbird. These rings are not made using automated machine tools or metal lathes. During the 2 day process, each ring is carefully hand formed around a custom made sizing die at 1000 degrees F.
The ends are welded using the Tungsten Inert Argon Gas method and then hand ground and polished to the final size and profile. Widths to 1/4" to 5/16"
Composed from a part which has two layers of the SR-71 Titanium metal. These rings display a feature presenting a texture unique to every individual ring. You choose the Surface Finish and Coloring. I offer three general choices in thickness. Depending on the width and size I will make the ring bulkier. I will select the best thickness, based on the width and size for a perfect balance between the look and comfort. Depending on the width and size I will make the ring as thin as possible. All photos are only examples of items produced using the SR-71 mission flown titanium. Items are hand made, no two items are alike nor can they be reproduced or duplicated in the exact likeness. I will try to achieve the requested colors, shapes, and appearance but all can vary slightly. The extreme conditions in which these parts were operated has a variable effect on the finished product. Operating at 3,200 degrees F with pressures exceeding 34,000 pounds per square inch, along with the tremendous earth shaking vibrations at the SR-71 exhaust afterburner that propelled the 120,000 pound aircraft faster than a high powered rifle bullet. It's simple to understand how these conditions effect the metallurgical structure of the titanium metal as well as being hand made. This is why the finished items including rings will all be unique in appearance. You design your own ring ! Includes a personalized Certificate with all the details as well as a Fact Sheet. FREE- USPS PRIORITY Shipping in the U.S. Note: All metals and finishes can be scratched when abraded. Titanium is much harder than gold or silver. The finish and coloring effect surface hardness. The darker the color the more durable the surface. 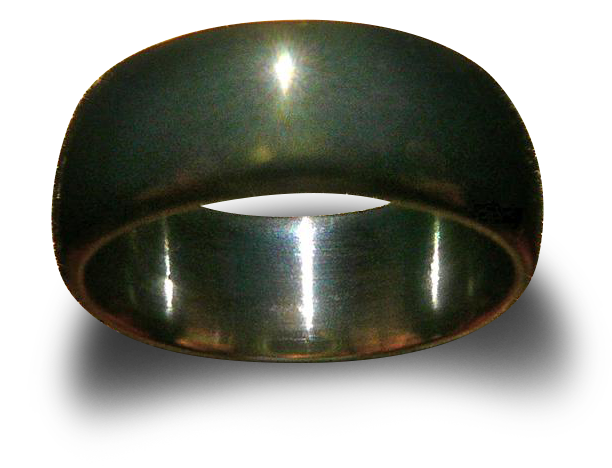 All rings are rounded on the inside diameter for a comfortable fit.